Because orchids have a reputation for being hard to grow, everyone always wants to know what the easiest orchid for beginners is, and the answer is nearly always the same: phalaenopsis orchids. These plants, also known as “moth orchids” for the delicate wing-like shape of their leaves, are popular with beginners (and veterans, too!) because of the relative ease with which they can be grown. One Stem = Focused Care – While some orchids have multiple stems, each of which can contain several flower spikes, the phalaenopsis orchid is monopodial. Which simply means that it always has just one main stem. While beginners might want to go for the orchid with the “most” flowers, the one stem on a moth orchid is easier to care for. This means it can still grow several colorful flowers, while giving it a delicate yet robust appearance. And that, for many, is what the orchid is all about in the first place, right? Manageable Sunlight – While some orchids can have touchy light requirements such as direct sunlight or even exposure to moonlight, the phalaenopsis orchid is pretty “middle of the road” as far as this goes. Manageable Temperature Needs – The relaxed attitude the moth orchid has towards light also extends to its temperature needs. While some orchids can’t handle even slight variations in cold or heat, the phalaenopsis orchid does well in temps ranging from 75 to 85 degrees Fahrenheit (so room temperature is fine). It won’t be in much danger unless temperatures go outside the 60-90 degrees F range. Standard Humidity Needs – Some orchids thrive in tropical climates, and others grow best in drier areas. Again, the phalaenopsis orchid is fantastic because it is tolerant of greater variations in humidity than most other orchids. As long as humidity is around 50%, you’ll be fine. No matter where you live, this can easily be achieved with a basic humidifier. Water and Walk Away – Unlike some orchids that demand constant attention to the level of hydration, phalaenopsis orchids are more forgiving. This isn’t to say that proper watering isn’t important; the moth orchid needs a careful balance of water as much as any other plant. The key is that this particular genera does well with minimal care – you can generally water them about once a week and they’ll be fine. Constant Blooming – The moth orchid contains no pseudobulbs, which means that once the plant enters the blooming stage, all its energy is pretty much directed towards the flowers. With the proper care, you can keep this orchid in a state of constant blooming for a long, nearly indefinite period of time. Since re-blooming is one of the more difficult aspects of growing orchids, this is a great reason to give phalaenopsis orchids a try. From their resistance to beginner mistakes to their colorful and fragrant blooms, phalaenopsis orchids are a favorite that you’re certain to love. My alltime favorite flower of all time. I love everything about orchids and can’t imagine a more beautiful plant that is reltively easy to manage. You just need understand how they grow and you’ll be fine. 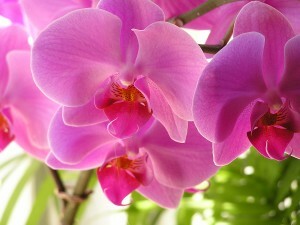 I love the moth orchid. In fact I have 6 of them all over the house and they really bring a peaceful feeling to our home and are always a conservation starter. Thanks your for highlighting them. I got one of these from a thai restaurant last night, not dead yet so we are going well. WE love Phals, but like to know more re -initiating flowering tips. We find our Phals suffer after the flowering. Is there any remedy for this? Thanks for your comment. You’ve inspired us to do a post about this. Flowering takes a lot of energy, so it’s not uncommon that they struggle a little afterwards. Keep caring for it like you usually do, but if it looks like it needs to be repotted, after it’s done blooming would be a good time. Phalaenopsis is my favourite plant, they flower longer and more constantly. As told in the messages, over rain and sun are their ajor enemies. Thanks for the deep knowledge provided by this site and news letters…. I have two of these orchids that I purchased about four months ago. One bloomed a beautiful purple, the other was a light yellow with some orange stripes. I have enjoyed them so much. They are both flowerless now. They are in the original 3″ diameter plastic cup. There are many roots and the leaves are still a beautiful green. I didn’t know if I repotted if they would bloom again? I am a friendly gardener and don’t want to just throw them away if they will bloom again. Thanks for any and all responses. Happy Gardening to you all, too. Oh man, I should have done my research before I repotted my orchid this last weekend. I need to get home right now and get it out of the pot! please don’t die on me. . . I re potted my one and only moth orchid last month whilst it was still in flower, since then the blooms have fallen off and left with bare stem. Just noticed tiny bud like appendages at each flower stalk. Is this normal ? Thanks Mary Ann I will give my plant all my love and attention. I have a Phalaenopsis and wanted to know why one needs to repot? Is it due to the plant outgrowing the pot thus Im needing to get a bigger pot or is it so that I can cut off the old/dying roots and put it back into the same pot? i have overwatered my moth orchid. Its doing ok…sitting on my porch(ft Myers). but it should “not” be repotted because of the overwatering….right? My partner just got me my first orchid today, to make me smile. And I have fallen in love with it, thank you for this article, now I know to care for the orchid. I’ve always wanted an orchid but didn’t want to spend the money because I’ve heard you really need to know a lot about them and how to care for them and was afraid it might die on me. For my birthday Sat. one of my sons sent me a beautiful Phalaenopsis (I think) and I’m still smiling! It is the most beautiful gift he has ever given me and it turly touched my heart. There is one main long stem (over 2 feet and another coming off of the one @ a feet from the top. This one has two small ball like buds on it. I was gone for the weekend and returned last night Monday) and it appears to have several blooms that are drooping. I’ve yet to read up on these plants and don’t know if it is the location, dining table, or needs water. Before I do it any damage, do you have any recommendation? I’ve made several attempts with Phals but can’t get the hang of it. They seem to drop their flowers, the leaves get wrinkled, and the roots rot. Am I over watering or is this the result of buying plants from Walmart and Home Depot? Love this thread ty. So I have one phal and I’m not an overly skilled gardener. After it bloomed in the fall the main root dried up but the leaves and roots (they are extending out of the pot now – grayish) seem to be thriving. I clipped the dried out stem. I see some new growth that looks like a possible new stem. When it grows enough to reach the support pole do I just clip it to the pole? What about the grays roots? How can i propagate this cool “tolerant” plant.? Thank you so much. I have had my orchids for 3-4 years and suddenly 2 of my more mature plants has lost all of its leaves and the stem has dried/gone woody 🙁 Is that it for them :(((( ??? Thankyou Maryanne for your response…not looking good! I was given a moth orchid last April – it had 2 stems with beautiful blooms which lasted through August. They then fell off……After discussions with a keen orchid-growing friend, I cut off the stems just above a bud…..since then, the stems appear to be dieing back from the tips, two leaves have yellowed and fallen off. I have been watering the plant but not feeding (I was feeding with a drip feeder while the flowers were blooming). There are 5 dried/twig-like roots sticking out at the top of the pot. I can see thicker green roots among the bark. Help ????? PS I am a first-timer…. I love Phal’s too. I must have 10. I started into orchids in 2014. My first was a gift on Mothers Day 5-22-2014. I became an addict at that point. I now have about 20 total. NONE are in bloom. Very bummed about that. I hope the reason is that they are too young.